Diigo ~ Webware 100 winner! 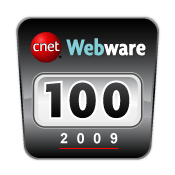 The results are out, and we’re thrilled that Diigo has just been named a winner in CNET’s 2009 Webware 100 Awards in the Browsing category! The Webware 100 Awards recognize the best Web 2.0 sites, services, and applications on the Web. Nearly 630,000 votes were cast during the voting this year to pick the best Web 2.0 sites and services. In the browsing category, we were up against major platforms like Firefox, Internet Explorer 8, Google Chrome, Safari, My Yahoo, and 24 others. We appreciate that so many of our users and fans made their way over to vote for us and made us a winner. We couldn’t have done it without your kind support! Thanks so much to everyone for your votes, support, and engagement on Diigo! Transfer status: Due to the huge amount of transfer requests, transfer will take a while (a few more days) to complete. For those who have initiated the transfer and if you haven’t received an email from us (or have only seen partial transfer so far), don’t worry. Your request is still a work in progress and will be completed soon. Please see the latest transfer update in our user forums. Data access: While your furl links transfer may take a while to complete, you can start adding new bookmarks to your new Diigo account. Before Furl is completely phased out, you can still access your Furl data there and export them elsewhere. The choice is yours. Furl cache (archives): This transfer only takes care of your bookmark links. We are evaluating the the best possible solution to transfer those cached pages, but it will take some time. So please stay tuned! Meanwhile, you can access Furl directly and export them there. We are very pleased that Furl has become part of Diigo.com and would like to warmly welcome you all to the Diigo community! Due to the huge amount of transfer requests that we’re processing at this time, the transfer may take one to a few days to complete. Thanks for your patience. While your Furl data transfer may take a while to complete, you should be able to access your Diigo user account right away. Use the diigo username (should be given during your transfer Step #2 process) and same furl password to access your new diigo account. Once bookmarks are imported, it will still take one or a few days for your tags to get indexed, shown and searched properly. When you sign in to Diigo the very first time, you will be prompted to install either our Diigo’s toolbar (Firefox / IE), or Diigolet (all major browsers supported). Then you’ll be ready to begin Diigoing! The Diigo team is passionate about making Diigo the best knowledge sharing and management platform for individuals, work groups, and companies. We look forward to having your active participation in the Diigo community. Lots more exciting projects forthcoming. Stay tuned, as we continue to innovate and evolve!